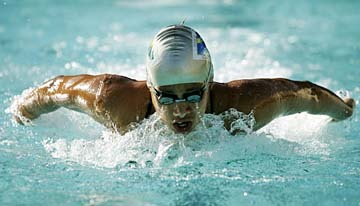 An e-mail in January notified Christel Simms that she had been cleared to swim for the Philippines in the Summer Games. DELAYED gratification never felt so good for Christel Simms. The Punahou junior had the Olympic dream on her mind and Beijing, site of the 2008 Games, in her sight. In the USA Junior National Swimming Championships at Indianapolis in August, she made the cut to represent the Philippines in the Olympic 100 freestyle -- with precisely the 57.17-second time she needed to qualify. But it took quite a bit longer for Simms to become just the seventh woman to represent the Philippines in swimming going back to the Paris games in 1924. She is a dual citizen who was born in Hawaii and had to get cleared by her parents' native country. Finally, in January, nearly half a year later, word came. "One night I came home and my mom had this big e-mail on the computer," Simms said. "She said, 'Look at the computer,' and I was like, 'What?! Wait, am I going?' I was so shocked. I'm going." She'll be joined by four male Filipino-American swimmers, including 2007 Kealakehe graduate Daniel Coakley, who was instrumental in nudging things along and relaying information between the country's Olympic body and the Simms family in the early stages. The team of five could grow if more athletes qualify for events, and Christel has come close to clinching additional Olympic berths in the 50 freestyle, 100 backstroke and 100 butterfly. She has until July 15 to do so -- then she heads to the Philippines for a two-week team orientation before flying straight to China for the Games in August. Simms, a junior at Punahou, has a long-term goal of representing the U.S. at the 2012 Olympic Games in London. The preliminary heats for her 100 free event are Aug. 13. If she does well, she can advance to a semifinal field of 16, followed by a final list of eight in competition for a medal. She's compared her average times in the 100 free to the rest of the field. They don't quite stack up yet, but Simms is confident she can shave precious seconds off in the coming months. Simms could possibly represent the USA (her long-term goal) in the 2012 Games in London. She has already grown familiar with seeing the world's top-notch competition in adjacent lanes. "Oh yeah, there's great Olympians who are going there," Simms said. "Like Natalie Coughlin for Team USA, she goes like 53 for the 100 freestyle. I go like a 57, but I'm hoping to get that time faster, maybe go a 55 or something. "Being with them is a great honor too, but I've been competing in the same events as them since I was 15, so I have that experience already and I won't be all nervous." Simms, 17, has the credentials back home to back up her confidence. She owns 55 Hawaii state swim meet records in various distances, age groups, and strokes (all except the breaststroke), going back to active club competition shortly after starting swimming at 9 years old. She also has two individual HHSAA state meet records, the 200 and 100 frees. Hawaii Swim Club coach Scott Sherwood has advised her nearly every step of the way at three different clubs. He was impressed with her natural ability from the starting block of her career. "The term is 'holds water,' she can grab a lot of water," Sherwood said. "She just holds a good amount of water with her stroke. I think her physiology kinda helps her because she's fairly slim, she's got pretty long arms, big hands -- not tremendously but they're bigger than mine. And she's got big feet. "She's got flippers and paddles; she's just naturally gifted," he added. That wouldn't mean anything if Simms didn't have the drive to see the journey through. Throughout her junior year, she's gone on week-long trips around the world for meets that have tested her social and academic resolve. The schoolwork from missing five days of class can mount up quickly, and two weekends ago, she missed her junior function (prom) while at Washington State for more qualifying attempts. "I was really bummed out," Simms said. "I had to miss a lot of stuff, but my friends said, 'It's OK, we're going to have fun, don't worry about it, you're going to the Olympics.'" Her Punahou teammates and her coach, Jeff Meister, were "very supportive," Simms said, of her increased workload on the side. Her routine often varied from that of the rest of the team. Simms, who plans to go to college on the West Coast in 2009, said her teachers have also been understanding. Next month she goes to Stanford for its Grand Prix meet. Then it's straight to Manchester, England, for the FINA World Championships, where she'll represent the Philippines for the first time. Simms hasn't been alone on these journeys, and won't be leading up to her biggest meet ever. Along with Sherwood, her mother, Jocelyn, father, Charles, and some extended family will accompany her to Beijing. Jocelyn is a living encyclopedia of her daughter's accomplishments and can recite records upon request. "She's always self-motivated," Jocelyn said. "You don't need to push her; she'll do it on her own, and she sets goals: 'I'm going to set this record, I'm going to be competing in nationals.' She's done all of them." By the time, Simms arrives in Beijing, count on her to have a few more.